The photos lay in front of me, memories from years of Christmases and birthdays, like cards after a game of 52 Pick-up. I sit upon the floor, left leg extended and right folded in, and study each photo, searching for the family favorites, my favorites. The scissors, swiped from my grandmother’s sewing basket, wait to my right, the glue to the left, the foil and felt within easy reach. Mother’s Day is several days away, and this will be a gift to remember. My hands shuffle through the photos, selecting. 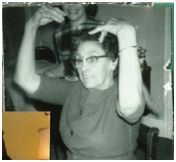 Three of my grandparents, sporting corsages and a boutonniere, make the cut, as does my Grandma Cullen sitting at the dining room table, arms above her head and wiggling her fingers, doing ‘the mouse’. Another dining room photo, with cousins, siblings, aunts and uncles, dressed for the holiday; candles lit, standing, heads bowed…wiping whipped cream from hair and eyes. I think of silly string every time I see this photo, but that was a different dining event. I set the photo aside. I search for the best photos of my siblings, photos from childhood. The eldest brother and sister, in uniforms, pose for their first-day-of-school photos. Less formal, the next two siblings smile at the camera in their play clothes. 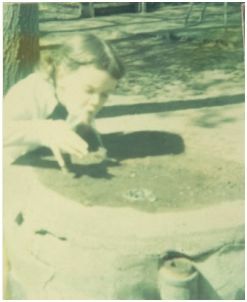 Then my brother, two years my senior, and me sipping from the Grace Lord Park water fountains. I can hear the rush of the Rockaway River in the background; I can hear Mr. Cook, our postman, encouraging us to dunk our heads into the river’s water at our swim lessons. I set these sibling photos with the grandparents and cousins next to the scissors. A photo of my brothers, one a serious teenager; the other an exuberant child, are selected. Then a series of the exuberant child, barely seven, dressed as Santa, washing his hands, pillow-stomach sagging over his britches to the floor. Later, stomach tucked firmly back in place he sits in the Santa chair with me wearing footy pajamas sitting on his lap. A nephew, a niece, Dusty our dog, dear friends, and the best gift ever: the Fripley’s Unassembled Good Children in it’s large brown box, join the growing pile of photos. I reach for the scissors, and stop. A momentary twinge: I shouldn’t cut these photos; they are our favorites. But I cut anyway. I trim and cut and position the photos on an 11 x 12 piece of foil-covered cardboard. Then using blue felt I trace and snip each letter of the word ‘MEMORIES’ and begin gluing. I finally slip my masterpiece into a frame and wrap it. This Easter Sunday, my eldest brother handed me several boxes of memorabilia remaining from my parent’s lives. Among the old letters, address books, and playbills was the framed collage, given to my Mother that long-ago Mother’s Day. I remember watching her face as she opened the childish gift. I worried that I had destroyed her most-loved photos. What she thought when she first saw the gift, I will never know. I do know that she smiled, hugged me, and said she loved it. Throughout the years that followed, each time I visited my parents, it was always hanging in a hallway or room for all to see, until the photos faded from years of display. To my siblings, I apologize for cutting our favorite photos. I hope that you will forgive me, just as I believe our parents did on that day so long ago. On the other hand, with scanning and photo shop technology being what it is, at least I know what you’ll be getting for Christmas this year. No scissors or glue needed. This entry was posted in Nostalgia and tagged Grace Lord Park, Memories, Mother’s Day, Photos, Rockaway River. Bookmark the permalink. I have never used photo shop, but I will be trying it out to see if I can restore these. Thanks for visiting my blog and for commenting.